The village of Hazelton, British Columbia, also known as 'Old Hazelton', is located northeast of Terrace and northwest of Smithers along Highway 16 (Highway of Tears) and is found on the shore of the Skeena River and where the Bulkley and Skeena Rivers meet. Approx 300 people live in Hazelton. This area is the home of four First Nations, three of which are the Gitxsan people (Gitanmaax, Glen Vowell and Kispiox) and one who are the Wet'suwet'en people (Hagwilget). Gitxsan means People of the River of Mist. One of the first public acts asserting Gitxsan ownership of their 33,000 square kilometers of land occurred in 1872. At that time, the chiefs from the Gitxsan community of Gitsegukla blockaded the Skeena River to all trading and supply boats to protest the actions of miners on their territories. The Gitxsan people continue to seek recognition of - and assert - the ownership, jurisdiction, and aboriginal title of their traditional territory and its right to self-government. 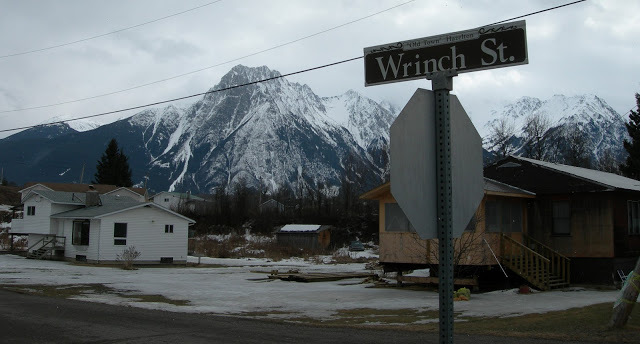 Hagwilget is a Gitksan word meaning ‘place of the quiet people.’ The village name in Wet'suwet'en language is actually Tse-kya, meaning is ‘base of rock.’ Other Wet'suwet'en nations include the Ts'il Kaz Koh First Nation and Moricetown Band.